Nutmeg is the seed of the tree. Jaiphal is used for flavouring many dishes, usually in ground or grated form, It may be used in small quantities in garam masala. Nutmeg(also known as Jaiphal in India) is one of the two spices – the other being mace – derived from several species of tree in the genus Myristica. Nutmeg is the seed of the tree, roughly egg-shaped and about 20 to 30 mm (0.8 to 1.2 in) long and 15 to 18 mm (0.6 to 0.7 in) wide. Nutmeg trees are dioecious plants which are propagated sexually and asexually, the latter being the standard. Nutmeg and mace have similar sensory qualities, with nutmeg having a slightly sweeter and mace a more delicate flavour. Jaiphal is also a powerful herbal alternative medicine. It is full of essential nutrition, mineral, vitamins. Nutmeg is an excellent sedative which is beneficial for treating inflammation and abdominal pain. By effectively stimulating the brain, nutmeg acts as an excellent brain tonic. Jaiphal helps in eliminating fatigue, stress, anxiety and depression. Nutmeg is useful for digestion and treating digestion-related problems, such as diarrhea, constipation, flatulence, bloating, vomiting and indigestion. Halitosis, or bad breath, is effectively cured with nutmeg consumption due to its anti-bacterial properties. Jaiphal has been known as a home remedy and natural cure for sleeping problems. Nutmeg works as a natural aphrodisiac that imitates the effect of the hormone serotonin, which causes sexual arousal and also provides a relaxing effect on the body. Apply paste of Nutmeg (Jaiphal) and water on forehead to get rid of headache. Drinking mixture of jaiphal and milk improve function of the brain and excellent in treating Alzheimer disease. Due to its antibacterial property it helps to get rid of mouth bacteria. Apply paste of jaiphal and water on your nose and forehead. This will soak up all the cold. Incorporate nutmeg into your diet to get rid of various skin problems like blemishes, acne and wrinkles. 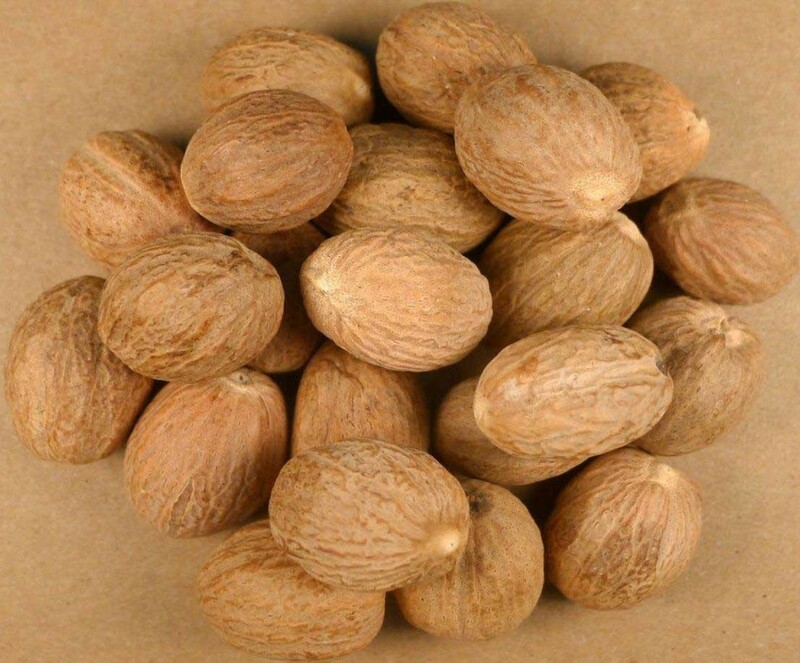 Buy Jaiphal or Nutmeg online at best price from KiranaPlace, a online herb and spice store in India.